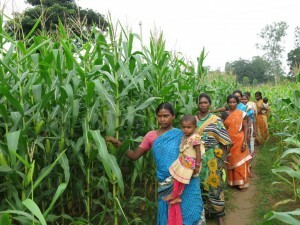 Women farmers in the tribal villages of Odisha, eastern India, are increasing their yields through the use of hybrid seed varieties, new technologies and better agriculture practices with training and support from the CSISA project and the Odisha agricultural department. 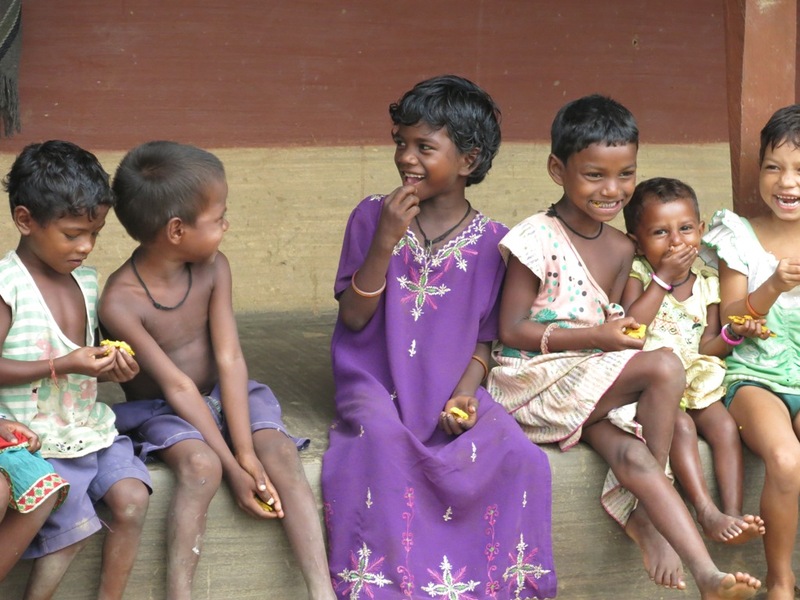 Badbil Rengalsahi is a remote, tribal village in the Mayurbhanj district of Odisha with high poverty and low literacy rates. The village is home to 40 tribal families who mostly farm for a living. They usually grow local varieties of maize in home gardens for household consumption and sell the little surplus as green cobs in the local market. Yields are often low because farmers use unimproved varieties and traditional sowing methods and lack information about good agronomic practices, especially weed and nutrient management. Maize cake is a common breakfast and snack for children in the area, and low maize production often means they receive less food. However, this situation could soon improve thanks to women self-help groups (SHGs) like Johar Jaher Ayo. It started when a team from CSISA and state agricultural officers met with 11 women from the Johar SHG, who learned about new technologies and improved varieties. “Members were initially hesitant about growing maize with these new methods, but after learning about the benefits they decided to grow a collective test plot of maize on one hectare of fallow land,” said CSISA agricultural specialist Nabakishore Parida. The farmers bought hybrid maize seed and fertilizer using their collected savings “corpus fund” from the Large Sized Multipurpose Cooperative Society (LAMP) of the government of Odisha and plowed the field with tractors instead of the traditional wood plow. CSISA team members provided the seed-cumfertilizer multi-crop planter with an inclined plate seed metering system. The planter — commonly called a “seed drill”— helps achieve optimum plant populations and higher fertilizer efficiency by seeding in lines at a precise depth and spacing and placing fertilizer below the seeds. “The women farmers usually don’t get the right information at the right time,” Parida said. “CSISA trained them on better agronomy practices such as nutrient management and timely weed control.” The women farmers are delighted with the results; their production has almost doubled this year compared to the previous year. “The work burden of these women has been reduced with the use of the seed drill,” said Kuni Murmu, president of Johar SHG.“Since women mostly do the sowing and fertilizer application with country plows, it used to take up a lot of our time.” In addition to harvesting a ton of green maize for use by their families and relatives, they have earned net profits of US $240 by selling surplus green maize and maize grain, and were even able to share green ears with neighbors. Concerned about more than financial profits, the women farmers were pleased that they could provide nutritious food for their children during the “lean” food season from August to October, when grain stores from the previous cropping season have been used up. Three women SHGs in Matiagarh village of Mayurbhanj have successfully adopted collective maize cultivation with support from CSISA. They took a fallow and bushy four-hectare plot on lease from the village landlord and used a seed-cumfertilizer multi-crop planter provided by CSISA to line sow. Site-specific nutrient management trials were also established to raise local awareness regarding the nutrient status of the soils and the benefits of balanced fertilization. “Line sowing with a seed drill has reduced our sowing cost and we could cover more area in short period,” said Babirani Sethi from Swarnalaxmi SHG. With good harvests this year, the Swarnlaxmi, Dhabaleswari and Mangala SHGs have earned respective profits of US $167 from 0.4 hectares (ha) of maize, US $242 for 0.8 ha and US $400 from 1 ha.